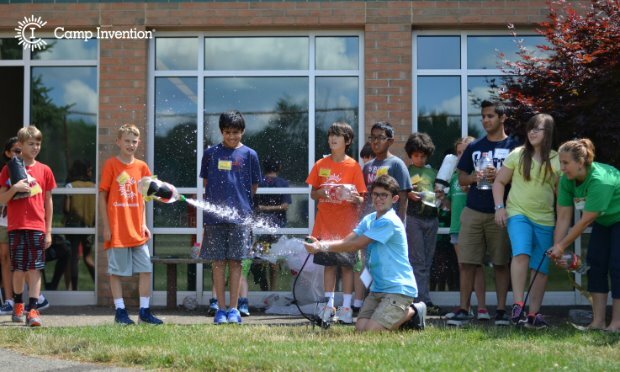 STEM and STEAM Summer Camps are cool and fun for boys and girls of all ages, whether you're in elementary school, middle school or even high school. There's always something new to learn. In addition to Science, Technology, Engineering and Mathematics, STEM now includes the letter “A” for Art, giving rise to STEAM. Since the world around us is constantly evolving and changing, a STEM or STEAM camp offers budding young scientists opportunities to be exposed to the latest in design art, science, technology, coding, digital art, 3D printing, virtual reality and much more. STEAM summer camps let kids have access to technological tools to learn, explore, think, create and collaborate on projects. International Ivy Summer Programs has over 17 locations with 60+ classes in New Jersey and New York with interesting subjects such as Culinary Arts and 3D Art Design. L3 Academy Summer Camp offers a class on Grossology & Robotics for Grades K-3. Gross Science is icky, sticky and FUN! Paired with Lego Robotics. 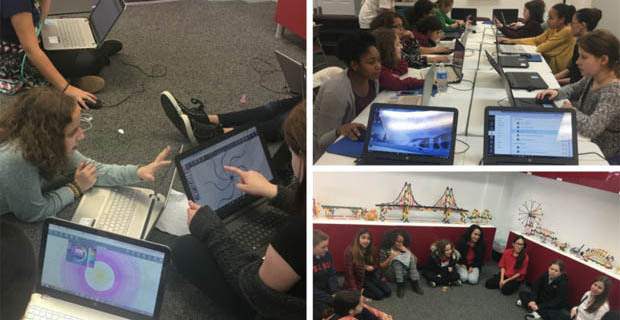 Montclair Learning Center STEM has unique weekly Girls Only STEAM Summer Camps in addition to their regular STEM and STEAM camps. Little Ivy Academy Summer Camp's International Espionage class where campers search for stolen data by using spy gadgets and drones. Shhh!! It’s Top Secret. Engineering Explorations STEM Camp engage campers in projects using CAD design software to make custom T-Shirts, Candy bar wrappers, magnets and decals. Camp Innovation is where young future innovators encounter 2 challenges and come up with inventive solutions. STEM Academy for Young Kids Summer Camp will have fun field trips to the Liberty Science Center and NJ Planetarium. 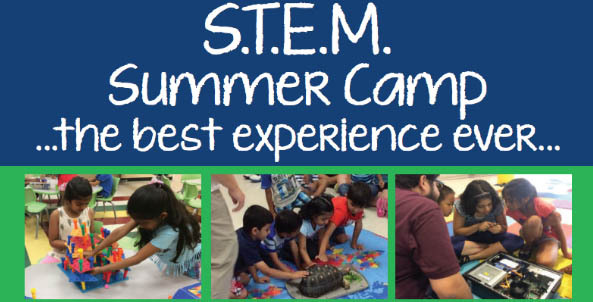 Most of these STEM camps are weekly and offer a wide variety of hands on courses. Check out what looks interesting and sign up for what fits your schedule. Parents are welcomed to call each camp to find out more information. 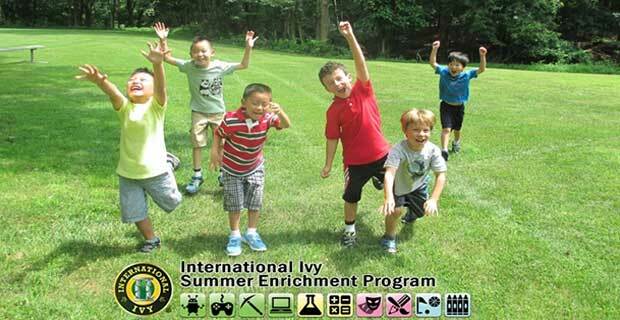 International Ivy Summer Enrichment Programs - for campers ages 5-15. STEAM subjects such as Robotics, Video Game Creation, Computer Programming, Science, Math, Minecraft, 3D Printing, Culinary Arts, Canvas Painting and more. Small hands on weekly classes, Monday-Friday, June 26, 2017-August 18, 2017. 17 locations in New Jersey and New York. Tel: 908-899-1338. 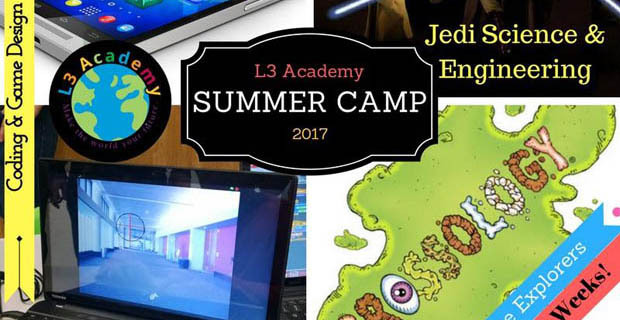 L3 Academy STEM Camps - Calling all young science explorers! Weekly STEM Camps with different themes ranging from Lego Robotics, Minecraft, Jedi Science & Engineering and Coding & Chess. K-8th grade. One Greenwood Avenue, Suite 101, Montclair NJ, Tel: 973-783-8333. Montclair Learning Center STEM Camps - Fun weekly camp for 1st-8th graders with curious minds who likes to invent, explore & design. Subjects: coding, robotics, chess, engineering, science. Girls Only STEM Camp available. Little Engineers Camp from 9am-11:30am for ages 3-5 yrs - fun STEM exposure with hands-on activities. June 26, 2017-August 25, 2017, 9am-5pm, half or full days. 73 South Fullerton Ave, Montclair, NJ, Tel: 973-744-7464. 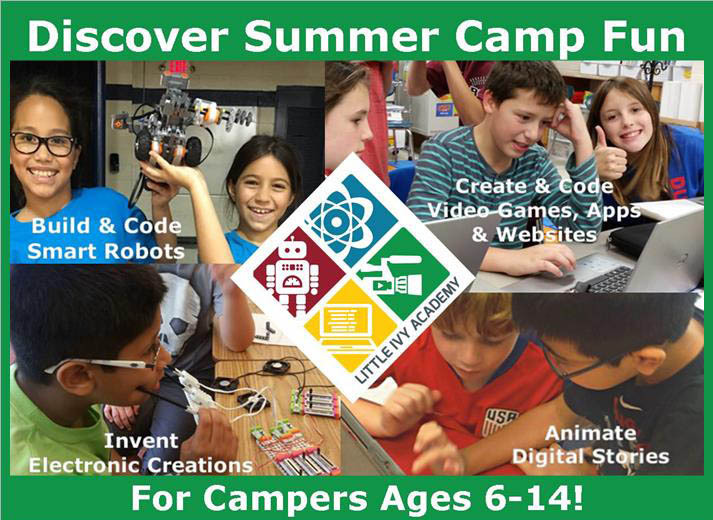 Little Ivy Academy Summer Camp - Rotate through Video Games, Robotics, Coding, Jedi Science, Film Special Fx Videos, Invent Smart Gadgets and more. Outdoor creative fun is included with all our one week camps. Extended hours available. Ages 6-14. Campuses in Ridgewood, Glen Rock, Pascack Valley- Rockland County Area. 660 East Glen Avenue, Ridgewood, NJ, Tel: 201-444-8400. Engineering Explorations - STEM Camp for tomorrow’s engineers. Make and keep your projects. Explore various facets of engineering. Fly drones, race RC cars, virtual reality, play video games. Courses taught by certified Technology Education instructors. Ages 8-15. July 10, 2017-July 28, 2017, 8:45am-3:15pm. Camp held at Madison High School. Tel: 973-945-1891. Camp Invention - one week STEM summer camp where future innovators build confidence in their ability to dream and create. Various locations throughout NJ. Tel: 1-800-968-4332. STEM Academy for Young Kids - camp for kids K-8th grades. Explore weekly themes - wacky inventions, computer programming, robotics, puppets, video production and more. Art, karate and swimming included. Great field trips to Aviation Hall of Fame, NJ State Museum and Olympics Day at the Park. 1665 Oak TREE Road ,Suite 400, Edison NJ, Tel: 1-888-855-STEM.